Having Br. Minalben here in London is a true blessing and a great opportunity for all to strive inwardly, understand, introspect, immerse and be happy. Scroll down to see the various events held. We will upload the video and audio swadhyays here for you to watch again. Video: Scroll down to watch them below. Audio: You can download these from our Google folder using this link. You don't need a google or gmail account for this and the downloads are free. It is an amazing experience to come together in Satsang and strive on this spiritual journey together. Br. Minalben's presence, wisdom and smile was just amazing. She made such a deep subject so accessible, practical and applicable to all of us in our daily lives. The weekend was uplifting, energising and eye opening. As we strive to move from gati to pragati, contemplating deeply on the 7 lakshan or defining characteristics of the soul are key in removing this delusion and immersing in the self. Br. Minalben's topic for the weekend was Letter 438 from Shrimad Rajchandra Vachanamrut in which Krupaludev writes a verse from Banarasidasji Maharaj Saheb in which he describes 7 defining characteristics or Lakhshans of the Soul. Minalben described each characteristic using the guiadance of both Param Pujya Bapuji and Bhaishree's explanations on this letter. She broke each characteristic into 3 key points of contemplation, how we can practically apply these contemplations in our daily lives and what benefits we get from their contemplation. 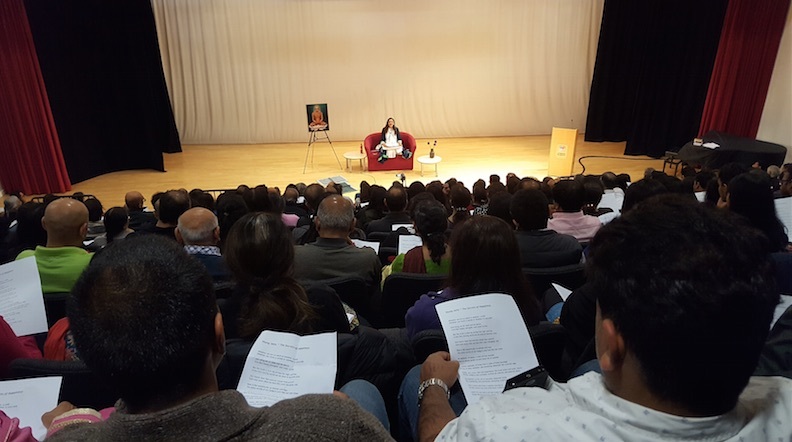 Shibir participants got the opportunity to meet Minalben in small intimate workshops throughout the weekend where she gave guidance on meditation, answered questions, clarified misunderstandings and gave us individual boosts of inspiration to strive forward. Mumukshus completed 3 meditations each day as well as silent reflection and introspection. The atmosphere was silent, yet vibrant, energising and immersing, joyous, awakening and so much more. As mumukshus we felt like a family seekers collectively supporting each other and inspiring one another on this tremendous journey. So wonderful. During the week Br. Minalben has been taking quotes or suvakyo of Param Pujya Bapuji. Br. Rasikbhai has expanded and reflected on these quotes in his book Satguru, Sant ane Satpurushono Mahtmya. Oshwal Association UK (OAUK) North West Area hosted Br. Minalben at their Ekta Centre in Kingsbury. With a full hall seating almost 300 people Minalben was greeted with a warm and inviting audience. Following some mesmerising bhakti by Paarul, Minalben took her swadhyay on the subject of 'Vinay' or Respect - taking her starting point from Bhagwan Mahavir's last sermon the Uttradhyan Sutra. We greeted the Mahavir Bhagwan’s Janma Kalyanak on a glorious spring day on 9 th April. Mumuxus, full of enthusiasm and anticipation, gathered at Niranjan, Bentley Priory to celebrate this auspicious day. Palak began our morning with her melodious voice, reciting the stuti of panch parmeshti and our gurus followed by one for Vir Prabhu. Br Minalben, with her enchanting voice, recited Navkar Mantra, followed by a stuti for all our gurus before her swadhyay. She started by highlighting the paramount importance of Bhagwan Mahavir’s teachings. She cited the example of how a small spark can set fire to a whole house with its contents. Similarly, a small spark, kindled by Bhagwan’s teaching, can bring about true realisation. She asked everyone whether they were ready to kindle that fire in their hearts, then they should join her in the journey. She read letter 105 from Vachnamrutji which, she said, needed no explanation as both Bapuji and Bhaishree had explained it many times in the past. 1. Who is eligible for being Bhagwan Mahavir’s disciple? One who is desirous to serve at the true guru’s feet. 2. We are the inheritors’ of Bhagwan’s legacy and for that we should be courageous and fearless. We should not show cowardice in face of obstacles but be brave and have the fortitude to overcome the obstacles progress. 3. Bhagwan described the virtue of forgiveness as an ornament for the brave and that it was the magnificent gateway to Moksha. Greatness lies not only in forgiving but also in forgetting the whole episode. 4. The fundamentals of Jain dharma are based on Syadvad (multifaceted view). It is only the Omniscient who can see the whole truth, a true seeker is never insistent on a particular view point. 5. After observing the above four points – one must try to recognise their own true nature. They must realise the soul merely resides in the body and should not remain deluded it is the body. Br Minalben told us that we all have the shelter of a true guru, we have been shown the path and have been given the means to progress on the path. She encouraged us to strive vigourously on the path and wished everyone success in their perseverance assuring us, realisation is possible in this lifetime. Br Vikrambhai accompanied by Hiren sang the last composition by Param Krupaludev – ‘Iche che Jogijan’ in his typical style, setting the scene for Bhaishree’s swadhyay. Bhaishree had undertaken considerable preliminary studies of the subject he wanted to cover in his swadhyay. He started by citing the 150 th birth anniversary of Param Krupaludev and 2615 th birth anniversary of Bhagwan Mahavir. He mentioned that Krupaludev’s spiritual development had been evolving since the time of Bhagwan Mahavir which has benefitted us tremendously. He cited various quotations of Krupaludev regarding Bhagwan Mahavir, and then referred to Letter 254, highlighting the qualities of one eligible to be addressed as a mumuxu. He then embarked on his main subject for the swadhyay, Letter 680, which Krupaludev had written on Bhagwan’s birth anniversary (Chaitra Sud Teras). This letter was not addressed to anyone but was a personal note. Each word from it oozes with compassion, the reason for which, is explained half way through the note. Krupaludev starts by referring to his own inner state where there is no desire left. By dwelling ceaselessly within his own true nature, even his desire for moksha has subsided. It is only someone like him can ask the God that ‘even though you are pleased with my inner state what else is there for you to offer me? ‘By residing within my nature all my materialistic activities have come to an end and that is my supreme bliss’. Krupaludev wrote this note on witnessing a procession of people, celebrating Bhagwan Mahavir’s birth anniversary dancing and merry making, as it passed by his shop. He noted in his observation that people who lacked the true wisdom, did not understand the true path. They imagined the path in their own minds and acted in a variety of ways to seek liberation and all they had achieved was extending the cycle of their rebirths – my selfless compassionate heart is crying out in pain. Bhaishree concluded the swadhyay by citing more quotations of Krupaludev of how Bhagwan Mahavir’s true message is misinterpreted and the misinterpretation being propagated leading to thousands of people continue sinking in to the quagmire of the materialistic word. There were a few more stavans on Bhagwan Mahavir to end the swadhyay session for the day. By the grace of Param Pujya Bhaishree, the U.K. centre is blessed with many dedicated mumukshus who have been on the path for many decades. Their sincerity and devotion has meant that seekers in the UK benefitedfrom visits by Param Pujya Bapuji and now from Param Pujya Bhaishree. With great compassion, our gurus made a special journey to ensure that those who cannot visit Sayla are still provided the spiritual nourishment they need. Many of these now elderly seekers together with mumukshus of varied age came together over two days on 8th and 9th October to share two wonderful days together of contemplation and medication. About 70 gathered at the grand Harrow District Masonic Centre. A great number of volunteers came to together to serve their fellow seekers and this ensured that the retreat ran smoothly. The shibir was organised as a meditation retreat. Those graced with instruction in dhyan were able to meditate together three times each day in an atmosphere of calm, peaceful striving. On the first day Param Pujya Bhaishree graced us with an uplifting message. Sadhaks and mumukshus alike had the wonderful opportunity to watch video swadhyays of Param Pujya Bhaishree. The swadhyays were on letters from Shrimad Rajchandra Vachanamrut and were selected from later years. While unable to have Param Pujya Bhaishree here with us in the UK, his messages in the swadhyays directly struck us and awakened us. Bhaishree, our compassionate True Guru, seeks nothing by the spiritual advancement of each and every one of us and his deliberate, methodical analysis and illumination of Shrimad Rajchandra's letters was full of practical relevance and spiritual insight. In Shrimad's letters we have the rare opportunity to read the innermost thoughts and compassionate guidance of a highly elevated soul, both describing his own experiences and also directly addressing the need of the aspirant to whom the letter is addressed. Bhaishree, though immersed in the bliss and ecstasy of self-realisation, compassionately dedicates time through these swadhyays to make clear to us the importance of each message. He explains the background of the letter and its recipient(s) when necessary, outlines the problems diagnosed and the benefit of the thoughts, virtues and practiced prescribed. At times, there is much humour, the sort a compassionate father or elder brother might use to illustrate a common error; and yet the humour is used to uplift and illustrate the essence of the letter, without distracting from the purpose. Letters 779-781 are the final letters written to Param Pujya Saubhagbhai of Sayla. Saubhagbhai holds a special place in our hearts, for without him, we would no truly have the opportunity to recognise Shrimad Rajchandra. Saubhagbhai is also instrumental in Shrimad's self-realisation through the esoteric meditative practice of Gurugam. For this, Shrimad holds Saubhagbhai in great esteem and felt a great duty and sense of indebtedness to him. Shrimad had resolved to ensure Saubhagbhai's own self-realisation. In letter 779, Shrimad shares poetry from Banarsidas, under three headings: The State of Awakening to One's True Nature, The The State of Celebrating Experience, The State of Sthiti. Param Pujya Bhaishree explored in great depth how these would develop and be realised by a seeker and explained this in terms which each seeker might understand. The letter was written for contemplation by Saubhagbhai, and Shrimad emphasises to Saubhagbhai the importance of distinguishing himself, or disassociating himself from everything, urging him to abandon all other thoughts and associations, apart from dwelling on his own true nature. In letter 780, Shrimad describes the opportunity which this human body affords us: to develop disassociation (Asangpanu) and freedom from deluded attachment (Nirmohapanu). Shrimad tenderly seeks forgiveness from Saubhagbhai for any infractions with great humility, for they would not be meeting again. This is a hear-breaking and touching sentiment to experience. Finally, Shrimad urges Saubhagbhai to no longer indulge in any form of attachment or aversion. Bhaishree depicted a scene where we might be at our own deathbed and be engaging in thoughts of attachment for our loved ones, and this was a wonderful illustration of how delusion can distract us from our true purpose. In Letter 781, another poem describing tremendous, indeed remarkable, detachment is shared by Shrimad. Is it truly possible for one to be indifferent between gold and mud, for example? Again, in this letter, Shrimad emphasises the need for Saubhagbhai to manage any inclination towards anything in the world around him and to concentrate his inclinations on his true nature. Realising Saubhagbhai's great compassion that other souls attain the path to Moksha, Shrimad anticipates Saubhagbhai's inclinations towards his own sons and allays his concerns. Shrimad emphasises in his last few sentences to Saubhagbhai the power and importance of total detachment to all souls and focus on his own purely conscious atma, that this would lead to the highest states and to the end of suffering. Shortly after this letter was sent, Saubhagbhai passed away. Letter 817, though short, as a very clearly outlined step by step process illustrated in it. It is difficult to encounter a mahatma who has realised his own soul, is free from all duality and conducts himself purely due to the fruition of karma. This is a the process: rare encounter; recognition of this soul's inner state; firmly seeking his shelter; effectiveness of guidance and imparted wisdom due to this firmness; effective impact of imparted wisdom leads to Samyak Darshan, rendering us worthy of becoming free from the suffering of birth, death and so on. Shrimad reassures us that while it is difficult to encounter true seekers, let alone such a mahatma, it is possible. Param Pujya Bhaishree gave numerous examples of how we experience and express duality and he walked us through each step in the process described in this letter. Letter 819 emphasises the importance of not simply becoming disheartened and disappointed at our weakness in the face of passions and sense-objects. Shrimad emphasis the importance of cultivating valour. Bhaishree drew on the letter's suggestion to contemplate the lives of great souls. Bhaishree explained that many great souls have faced such challenges, and yet their lives illustrate how we can overcome them and progress spiritually. This is a very tender, reassuring and uplifting letter. In letter 820, Shrimad gives Shri Dungarbhai of Sayla permission to contemplate AtmaSiddhi and also Mokshamargprakash. At the same time, he plants certain seeds in the form of questions, such as asking Dungarbhai to consider, and then write to him, his thoughts on the virtues needed to be thought of Marganusari, familiar with the path: virtues for Samyak Darshan; virtues for Shrutkevalgnan; and the state for Keval Gnan, totally equanimous enlightenment and omniscience. This would inspire a powerful thought process. Letter 833 is Shrimad's last letter to Dungarbhai of Sayla, whom Shrimad affectionately called Achal - unwavering. This letter recommends disassociation at four levels: substance, location, time and inclination. Bhaishree affectionately, at times humorously and at times with firmness, described the various ways in which we associate at these levels. Shrimad reminds Dungarbhai about the distinctness of a the soul from the body: as sword from its sheath. Just as the moon lights up the whole world, but does not take on the form of the world, so with the atma. Just as the world does not enter the sky, so a self-realised soul remains distinct. Explaining that fear of death arises due to folly and lack of awareness of our true nature, Shrimad empowers Dungarbhai's elevation with the nectar of his wisdom. "I am distinct in every way from all, I am purely pure consciousness, unfathomable bliss of the highest order, purely and singularly pure experience...."
In letter 837, Shrimad explores the meanings of verse 10 of AtmaSiddhi, in which the True Guru's virtues are described. The letter addresses two questions: At what Gunasthanak would be manifest the Virtues of a True Guru? and What is Samdarshita (A state free from like and dislike, from desire, from the possessiveness of identificating)? While exploring these ideas in detail, Param Pujya Bhaishree treated us in the swadhyay to a succinct and methodical of the earlier verses in AtmaSiddhi. Shrimad's compassionate objective in this complete scripture, and his survey of the world of spirituality were brought to life by Bhaishree. How does a True Guru describe the virtues of a True Guru? Param Pujya Bhaishree masterfully did so without a single reference to himself, but clearly with selfless devotion to the lineage of True Gurus and saints. Seekers received wonderful spiritual nourishment and upliftment from due days dedicated to inner striving, made all the more impactful by diligent observation of maun, silence. Contemplating the distinct nature of the soul, and the virtues needed to realise it, and instilling the valour needed to overcome obstacles, seekers ended both days of the shibir with the recitation of Aho! Aho!